It was with profound sadness that the Museum recently learnt of the untimely passing of Werner Mörath, a wonderful friend and accomplished veteran Luftwaffe Schnellbomber pilot. 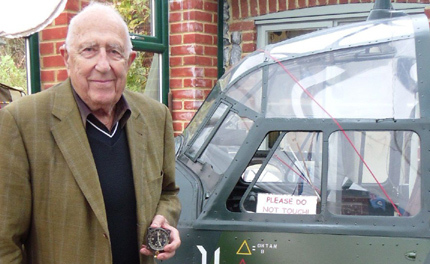 It was a very memorable occasion when Werner visited Shoreham to see the Schnellbomber cockpit and to hear him recount many of his amazing flying experiences and equally entertaining tales of his time as a prisoner-of-war. A very successful businessman post-war, Werner later enjoyed a very happy retirement, though the illness he suffered before he died was very undeserved. The Museum will not forget Werner and the Schnellbomber cockpit will stand as a memorial to his memory. In the accompanying picture, Werner is holding the aircraft clock he kept from the war that he kindly donated for the Ju88 cockpit. You are currently browsing the Shoreham Aircraft Museum – News archives for March, 2014.